Manchester Orchestra front man Andy Hull and guitarist Robert McDowell have put together a haunting and beautiful acapella score unlike anything heard before and possibly ever to be heard again. The complete lack of instruments lends an authenticity to Hank’s journey where he’s essentially singing to himself. To add a full orchestra or any instrumentation frankly would have distracted from the power of the story. Finally, I can’t even begin to say how much I respect and admire Daniels for taking on such an ambitious story and making an emotionally compelling and gripping film that takes such an unconventional path. What could have been bogged down in juvenile humor and gross-out jokes is elevated to a level I couldn’t have imagined. Leaving the film’s story in such an uncomfortable and real world place at the end was truly a daring move that I love increasingly the more I think about it. The gorgeous cinematography and set design is absolutely perfect for the tone of the film and make for a one-of-a-kind tapestry that elevates the film to becoming true art. I generally don’t bring up studios specifically, but it can’t be ignored that this is yet another film that fits in perfectly with the rest of A24 Films’ brilliant catalog that includes modern classics like Ex Machina, The Witch and Green Room. As far as I’m concerned, this studio has hit my list to check out pretty much anything they put out. Swiss Army Man is a film that digs into what it means to face our humanity and even our death while bringing epic amounts of flatulence and all manner of uncomfortable topics. It’s completely unflinching in its exploration and doesn’t hesitate to find the joy in life at the same time. I’m generally hesitant to call a film a triumph, but this is exactly the kind of film we need in cinemas and movie houses all over the country. Dave is located in Denver, CO and can also be found occasionally sullying various podcasts who don't know better than to invite him on. He also works with the team behind the Reel Heroes Filmmaker Series at Denver Comic Con. hey Dave, after reading you’re review, I might go check this one out. I’ll take a well executed story over a “blockbuster” any day. Thanks and keep the reviews coming. ???? Nice to see the site back up, and running. Had a quick question. I was very surprised to see all the hate for X-Men Apocalypse a couple months ago. No, it isn’t as good as Days of Future Past but it’s still a fun film. It might be my personal favorite comic book movie so far this year. I’m curious to know what you thought of the film. Also, wasn’t planning on seeing Swiss Army Man but I might have to with all of the praise surrounding it. Green Room was awesome btw. Thanks for the kind words, Clay. Jalen! Thanks for checking the site out again, man! I haven’t seen Apocalypse just mostly due to life circumstances that will be outlined in a post going out later this week, but I’m curious to see it. I’ve got a little bit of free time coming up, so I’m planning on trying to catch it and I’ll definitely chime in with my thoughts. 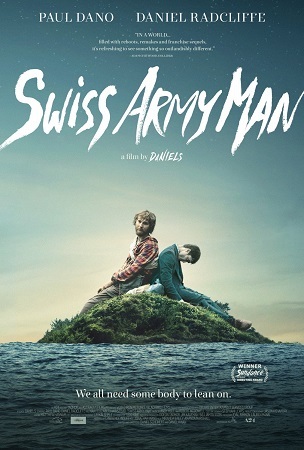 Swiss Army man is definitely a different kind of flick. It’s the kind of movie where the people who hate it are absolutely right and the people who love it are absolutely right. I can see both points of view pretty easily.